It's Book Arts Tuesday a day late. Yesterday was a day that felt better at the end than at the beginning. I spent the day getting together all the tax info for the accountant. It is always a great feeling to put the folder in their hands. Since 2000, April first has brought the International Edible Book Festival as well as April Fool's Day and the beginning of T.S. Eliot's cruelest month. Here's how it is described on the Book2eat website. April 1st is the birthday of French gastronome Jean-Anthelme Brillat-Savarin (1755-1826), famous for his book Physiologie du goût, a witty meditation on food. 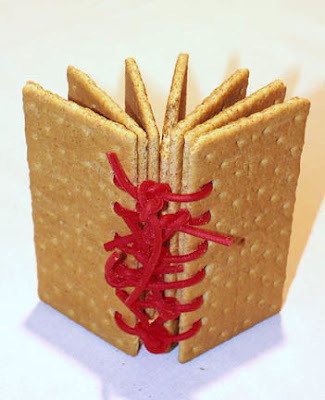 April fools' day is also the perfect day to eat your words and play with them as the "books" are consumed on the day of the event. This ephemeral global banquet, in which anyone can participate, is shared by all on the internet and allows everyone to preserve and discover unique bookish nourishments. This festival is a celebration of the ingestion of culture and a way to concretely share a book; it is also a deeper reflexion on our attachment to food and our cultural differences. The International Edible Book Festival is a creation of Judith A. Hoffberg and Béatrice Coron. Judith got the idea over a Thanksgiving turkey with book artists in 1999, and Béatrice created Books2Eat website where despite the distances everybody can enjoy worldwide's creations. They contacted friends and colleagues; their first event happened in 2000. Since then the festival continues as an annual sensation. Everyone is invited, individually and collectively, to this world banquet where delicious, surprising bookish foods will be consumed. The Edible Book Festival is held around the world. There are many more than those listed on the Book2eat website. If you're looking for some fun bookmaking and camaraderie at the beginning of next month, I suggest searching google to see if there is one near you. I particularly like the gallery on the Colophon page. 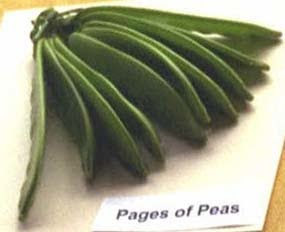 Here are a few of their edible books.